Danny Is the Bomb » Blog Archive » Danny Benefit Show in Newbedford Mass! 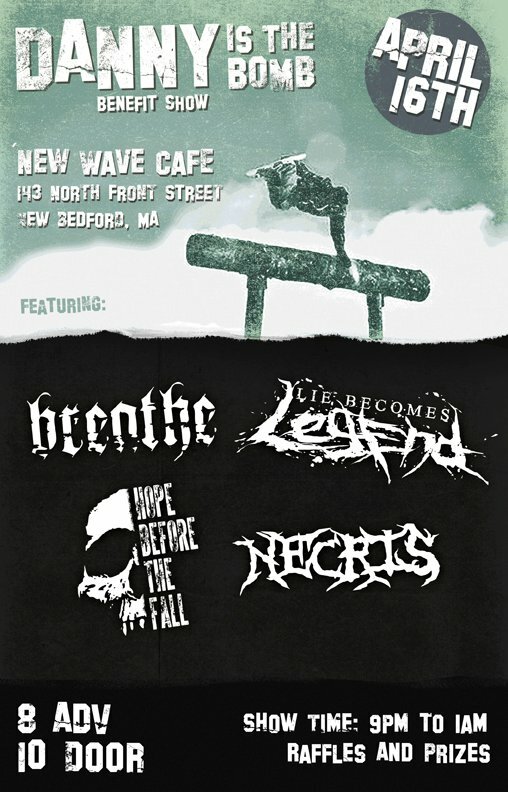 Danny Benefit Show in Newbedford Mass! 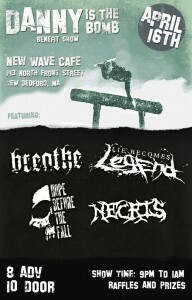 Brandie Popps is organizing a Benefit Show in Newbedford mass at the New Wave cafe. Tickets will be $8 and $10 at the door night of the show. There will also be raffels for local buisnesses/donations from local people. Some of which include…..
*Gift Certificate for any 1 cosmetic tattoo procedure (Eye liner, Brows, or lip) From Brandie Popps at Paradox tattoo. *Lie Becomes Legend will also be donating $2 from every Tshirt sale for the night! So buy up some mearch! !